To my knowledge, I'm sill the only freelance/self-employed consultant to openly publish a social impact report on myself - and this year marks the 13th one! And this year I've taken a different approach to how I present the findings of the indicators that track my 'social performance' from the stance of economic, environmental, and social themes. 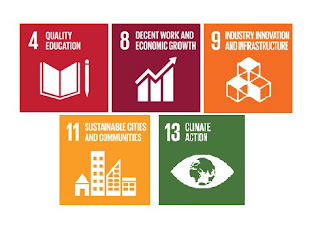 As well as continuing to benchmark the results externally where I'm able to source relevant comparisons, I'm also now using them to consider how far I'm contributing to the UN's Sustainable Development Goals. After all, small enterprise and freelancers make up the overwhelming majority of all the businesses in the world, so the best chance of being able to make progress against these goals is through our collective efforts, right? And while this take has been widely lauded so far (some even referring to me as 'genius' in doing so! ), it's not this new format which is my stand-out takeaway from this years impact report. Instead, it's the footnotes and narrative that I add where the results seem to be significantly different to the previous year - a sign that somethings not played out as I'd hoped, or, as has been the case in the past, actually an indication that the quality of my provision is actually far better than might have otherwise been expected in the circumstances (one year learner satisfaction fell 15% on the previous year, but digging into it, I found that over 1/3 of all learners on courses I delivered that year had attended under duress, so the satisfaction scores should have been correspondingly much lower!). And during the period that this impact report covers, I had a significant change in my personal circumstances - as well as the tail-end of recovering my business from the impact of the massive flooding that hit the Calder Valley at the end of 2015, I also moved out of the family home and relocated in another town (don't worry - I'm still a Northerner in the Pennines). the amount of pro bono support I was able to offer was down. And these are perhaps to be expected during a period of family change and upheaval, rethinking priorities about life, and no longer living in such close proximity to rail and bus terminals as I used to. However, these things aren't an excuse not to try and rethink how I adapt to my new circumstances in trying to maintain my commitment to working out my values in how I work - and to that end I'm looking to change how I offer to meet people, seeking to make better use of video technologies: something I'll be adding to my reporting matrix next year. And I think that that's something which is often missing from many impact reports I read from others - as well as the lack of external benchmarks and previous trends to help make sense of just how far achievements are worthy of recognition, an openness in committing to change their business models as a result of what they show.